Just in case you’re new to diving, recently moved to the region or just haven’t kept up with what’s been happening of late, here’s a quick overview. The first report of lionfish occurred back in 1983 off Palm Beach County, but no verified sightings occurred for several years afterward. Then, in 1995, an article in the American Fisheries Society newsletter, based on third-hand information, reported that an aquarium had been destroyed during Hurricane Andrew in 1992, releasing several lionfish into Biscayne Bay. This idea was picked up in the media (including my original lionfish article back in 2007), and the story stuck as to how the lionfish invaded local waters. However, since then it has come to light that the account was never verified; and more recent genetic analysis of tissue samples has disproven this single-release hypothesis. Today researchers believe that there were multiple release events that have involved at least 10 individuals. Still, even that’s an astoundingly small number to be the genesis of such a big problem. Lionfish sightings occurred sporadically in South Florida until 2000 when National Oceanic and Atmospheric Administration (NOAA) researchers documented multiple lionfish off North Carolina, South Carolina, Georgia and Bermuda. In 2007, lionfish were first detected in the Bahamas and have since increased their range dramatically. 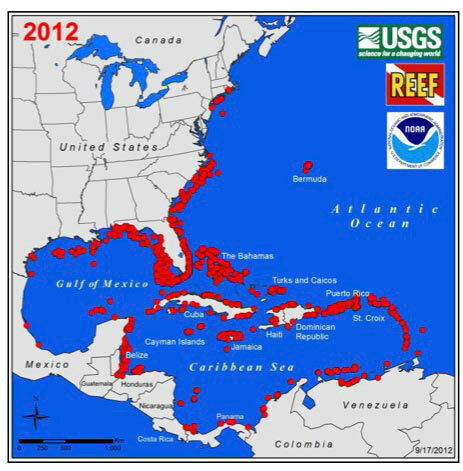 In 2009 they found their way to the Florida Keys, and by 2010 reached the Gulf of Mexico, thus settling into the entire region (See Figure 1). Today, lionfish sightings are common in most areas where they’re found. Regardless of when or how lionfish got their start in the Atlantic, two almost indistinguishable species — the red lionfish (Pterois volitans) and the devil lionfish (Pterois miles) — haven’t just taken up residence; they’ve laid down roots. About 30 different Indo-Pacific reef fish have been documented on Atlantic coral reefs, but only the lionfish have succeeded in establishing such a secure home. Today, despite local attempts at removal, in many locations around the western Atlantic, lionfish have reached population densities that greatly exceed those seen in their native Indo-Pacific range. 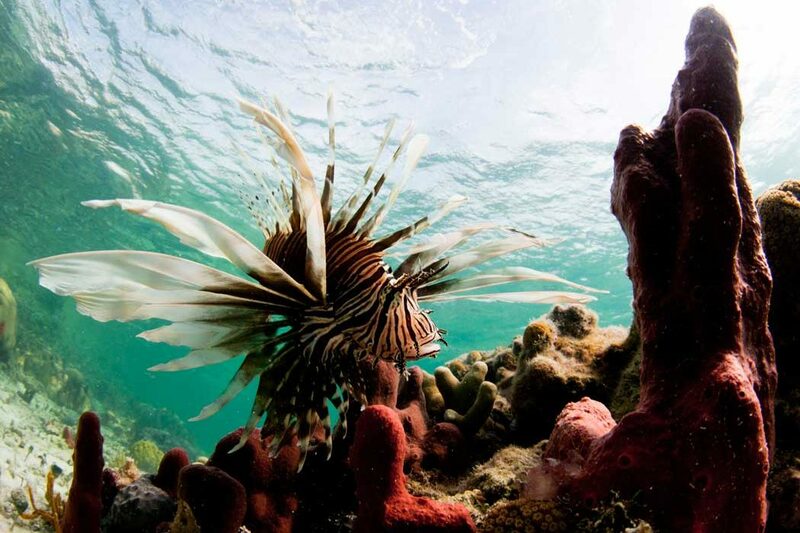 Surveys have found density in some areas of more than 450 lionfish per hectare (2.4 acres), more than three times that found in their native range. In the hardest-hit regions, such as the central Bahamas, lionfish densities have been documented at up to 2,000 per hectare. They’re also not only breeding successfully but they’re growing bigger than they do in their home range; in part, because they appear to have found a home with no natural predators. Their maximum size now in the Atlantic is more than 20 inches (51 cm). Aside from their striking appearance, it’s easy to understand why lionfish are so interesting to divers. Unlike most fish encountered on the reef, lionfish will often approach rather than flee. They’re also quite beautiful. 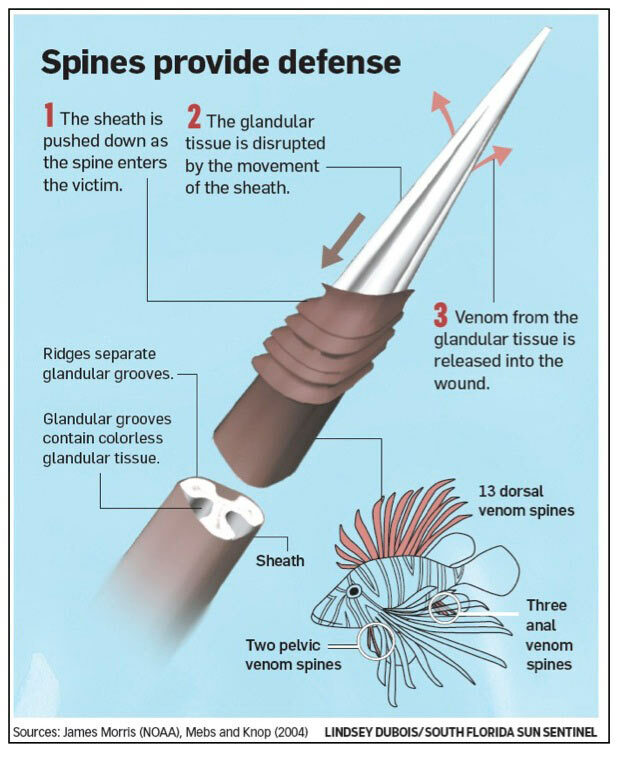 But their feathery fins are supported by sharp spines capable of injecting potent venom (although, as Figure 2 points out, not all of them are venomous). Those unfortunate enough to get poked by these formidable weapons experience intense pain and swelling, which sometimes requires hospitalization. Although a small portion of individuals may experience a severe allergic reaction, no deaths have been reported from any Atlantic lionfish envenomation. Figure 2 – Spines provide defense…and injury. Another interesting aspect of lionfish is their reproduction. 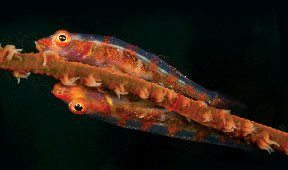 Although spawning has not yet been directly observed in the Atlantic, studies from the Pacific show that males engage in elaborate posturing designed both to intimidate rivals and impress potential mates. These behaviors can go on for days. If a female is impressed by the display, she’ll join her suitor. The pair then begins a spawning dance in which they circle each other face to face while slowly ascending. The actual deed happens just before reaching the surface. Unlike other fish that expel their eggs directly into the water — and provide a welcome and highly prized meal for fish — lionfish eggs are retained in a mucus ball containing a noxious chemical, making it unpalatable as a food source. As this “egg ball” floats to the surface, the male turns belly up and releases a cloud of sperm into it. Soon after — in some cases after only a day — the eggs hatch into larvae and, after about 26 days, settle to hideouts along the seafloor. Just three months later, the young are diminutive versions of their parents. What’s downright frightening is that a mature female may release egg balls every four days or so, resulting in a single female releasing more than 2 million eggs per year. Studies by Katherine Cure at the University of Guam and her associates indicate that lionfish in the Atlantic, while sharing some behavioral characteristics of their Pacific cousins, do differ in some important ways. For instance, while both Pacific and Atlantic residents are generally crepuscular predators (a fancy way of saying they hunt at twilight), the Atlantic group seems to hunt at all times of the day. They also seem to take advantage of the naiveté of the local prey. No other fish in the Atlantic hunts in the same way as these lions. So, Atlantic prey species simply don’t have any evolutionary history with the interlopers, making hapless local residents “easy pickins” for lionfish. A mature female may release egg balls every four days or so, resulting in a single female releasing more than 2 million eggs per year. Another conclusion from the Cure study is that Atlantic lionfish appear to eat larger prey than they do in the Pacific. This means that they ingest more food or, as fish scientists phrase it, have a greater “daily ration” than in their native range. Prey ranges from commercially important species such as grouper and snapper to ecologically vital herbivores such as parrotfish and damselfish. 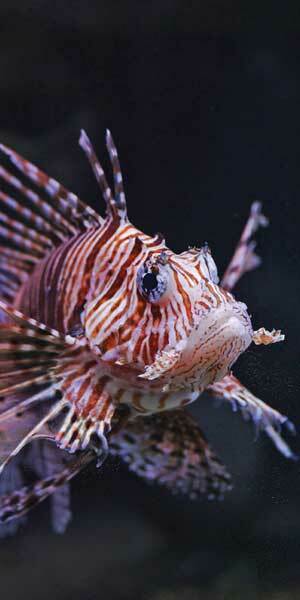 In one gluttonous lionfish alone, 64 fish were found in its stomach. Such gluttony is possible only with a stomach that can expand more than 30 times its size when empty. Yet another reason for lionfish success is also what makes them so problematic — they eat just about anything. So far, more than 70 different fish species have been found in the stomachs of lionfish, with some prey being half the size of the predator. A few years ago researchers in the Bahamas documented that these voracious piscivores can consume 80 percent of the juvenile fish population on a reef in as little as five weeks. And a more recent study saw a decline on some reefs of more than 90 percent. In turn, they not only eliminate the next generation of fish, but also take away the food source from native species, thus disrupting the entire food web. And as if that wasn’t bad enough, they don’t stop with fish. A wide variety of invertebrates such as crabs, worms and shrimp are also commonly found in stomach contents analyses done by scientists. While their ravenous appetite may be one reason for the exceptional size they reach in the Atlantic, another may be the lack of parasites. Researchers have found that the parasites normally found on Pacific lionfish aren’t found on Atlantic species. Thus, the energy lionfish would normally expend combating parasites in their home range can instead be put into growth and reproduction. This is a clear advantage over native fish species that are often ridden with parasites. More allies than ever — from scientific organizations to the general diving public — are now involved in the battle. But sifting through all the information — and misinformation — to glean what’s really going on can be quite a challenge. But there’s one group that has been at the vanguard battling the invasion since its inception, and that’s REEF (the Reef Environmental Education Foundation). Leading REEF’s lionfish efforts from the start has been their special projects director and longtime dive industry veteran, Lad Akins. I had a chance to sit down with Akins recently and get the skinny from him firsthand. “On a local scale we’ve seen that control efforts are working; where dive operators have started aggressively culling lionfish, they’re doing a really good job of keeping them at very low densities,” Akins said. His comments are borne out by at least two formal studies from the Cayman Islands and Bonaire, as well as many anecdotal reports from around the Caribbean. The only word to describe the true population estimate of Caribbean lionfish is mind-blowing. Still, Akins admits that this good news is probably reflected only at depths where scuba divers can venture. As lionfish are found regularly in fish and lobster traps pulled from hundreds of feet of water — and there’s been at least one sighting from a submersible at more than 700 feet (212 m) — densities are likely much higher in deeper water. Thus, the inability to access these deeper habitats probably ensures a continual supply, making eradication a virtual impossibility. For example, he cites the recent population estimate released by the Florida Keys National Marine Sanctuary of more than 300,000 lionfish Keys-wide. This, Akins says, is probably a low figure, as it’s difficult to evaluate populations in deep water. Akins also explained another reason population estimates even in shallow water may be underestimated. “Traditional fish assessment methods weren’t developed with lionfish in mind,” he says, “and appear to undercount lionfish by an order of magnitude compared to the newer, more meticulous methods we’ve developed.” It seems clear that the only word to describe the true population estimate of Caribbean lionfish is mind-blowing. o the contrary, feeding speared lionfish has led to many accounts of aggressive behavior by predators during encounters with divers. Incidents include severe injury to a collector’s hand from a barracuda bite and harassment of other collectors by sharks and large groupers. In fact, according to one dive operator on Little Cayman island, sharks have become so habituated — and aggressive — by handouts that divemasters spearing lionfish now risk attack. “There also is at least one Caribbean government that’s now considering terminating all eradication efforts due to safety issues resulting from feeding speared lionfish to predators,” Akins says. He strongly recommends that the diving community go back to the practice that, until this situation, was the norm: absolutely no fish feeding, regardless of the rationale. Another way to control lionfish is to create a market for them, which has become an increasingly popular menu item in Florida and at some Caribbean destinations. Currently, lobster fishers in the Florida Keys are now getting as much as $6 per pound whole for lionfish. When you consider this, and the fact that studies have shown a 50 percent lower lobster catch in traps that contain even one lionfish, commercial fishing for this other spiny reef resident is now a viable economic endeavor. As to the taste, I can attest that the first time I ate one it was hard to believe that they hadn’t mistakenly served me hogfish. It’s that good. Akins also terms “baseless” the recent reports of lionfish causing ciguatera poisoning. While there is apparently no scientist today who believes that eradication is possible, population control does seem possible. Pointing to the effect of the popular lionfish “derbies” now common at many destinations through the region, Akins says that they have produced results. For example, preliminary evidence from lionfish derbies in the Bahamas has shown a 65 percent decline in local populations, and a 50 percent decline in size. However, Akins cautions that these gains are short-term, and the effects can only be maintained through continual and diligent culling efforts. One hindrance to culling, according to Akins, is local laws and regulations. 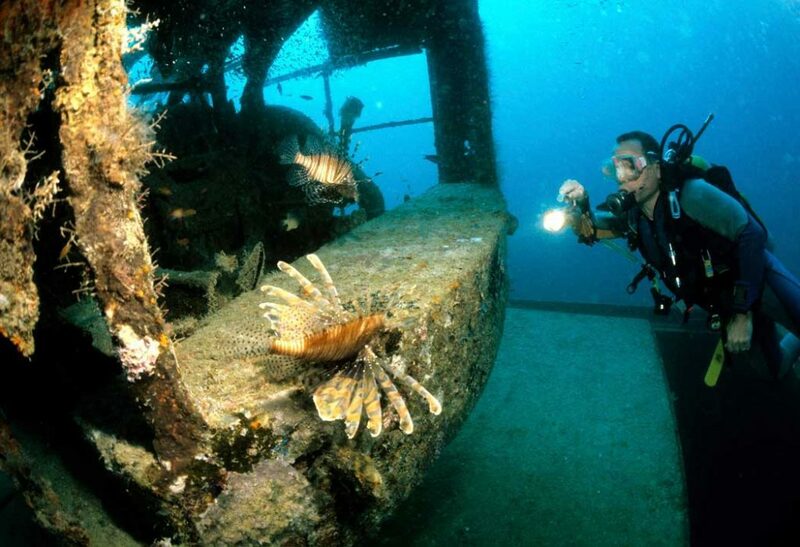 For example, aside from certain specially trained dive operators, divers still cannot spear lionfish in the Sanctuary Preservation Areas (SPAs) of the Florida Keys National Marine Sanctuary (although they can remove them with nets if they hold a permit to do so). This policy, Akins says, should and could be changed easily by restricting the type of gear used for removal, such as allowing only the smaller, customized spears developed solely for lionfish. That, plus making it illegal to possess any other species but lionfish within an SPA, should satisfy the concerns of regulators. Scuba divers are playing an important role in lionfish culling efforts in the Keys and Caribbean destinations. However, divers should not attempt to remove lionfish without receiving training on how to go about it safely. Divers should also be properly equipped. Permits may be required. To their credit, the State of Florida has taken some very positive steps in removing this invasive species. The Florida Fish and Wildlife Conservation Commission revised the state’s fisheries regulations to allow spearing of lionfish without a saltwater license, and allowing the take of any size or number. 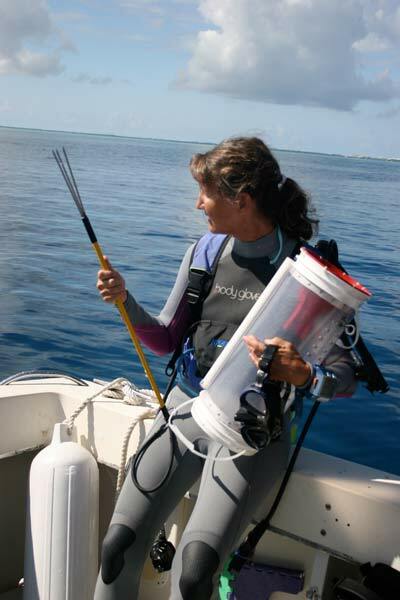 Still, spearfishing for lionfish on a rebreather, or within certain distances from shorelines and docks, remains illegal — practices Akins says should be allowed. Due to the extreme depths that rebreather divers visit, they’d be an ideal community to better assess and remove lionfish from their deeper habitats. More significantly, Akins cites the fact that, while positive steps have been taken, Florida still has no comprehensive lionfish management or control plan in place. But at least the state has taken a first step in designating a lionfish task force. The aquarium industry continues to import more than 60,000 lionfish into the United States from the Pacific each year. Additionally, while many Caribbean nations such as the Cayman Islands and Bonaire have developed very aggressive control plans, there are some countries that have done little or nothing to put in place a control plan, or even revise their fisheries regulations to allow more effective culling. Indeed, in some Caribbean nations much more can and should be done. There are other positive steps in the works, as well. A regional management strategy is under development by the International Coral Reef Initiative, United Nations Environmental Program and U.S. Department of State. Additionally, a U.S. national lionfish strategy is also in the offing under the Federal Aquatic Invasive Species Task Force. Clearly, more forces have begun to fight the invasion. Meanwhile, the aquarium industry continues to import more than 60,000 lionfish into the United States from the Pacific each year. What havoc the invaders will eventually wreak is anyone’s guess. But I’ve yet to hear one positive scenario. Hopefully, a serious regional effort can keep the invasion at bay.